Imagine if you will, traveling 4 hours to stay the weekend with 2 people (and a dog) you had never met. This is exactly how my first time went meeting Alex and Sonja from A Couple Cooks in early 2012. Back when I lived in Illinois, it was only a four hour drive over to Indy. We had been online friends for a bit but I knew they were something special (and it was SO true). Many years and a couple kids later, I still feel lucky to call them my friends and these awesome friends just published an amazing cookbook dedicated to simple vegetarian recipes: Pretty Simple Cooking. 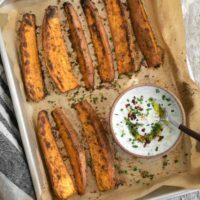 These spiced sweet potato wedges are part of their side dish section but if you’re me, you eat them for breakfast and possibly lunch. I love the warmth of the allspice and the simplicity of the chives + sour cream makes this dish easy. Best of all, that’s pretty much the entire book (they don’t call it pretty simple just for fun!) If you’re looking for a bit of variation in your vegetarian cooking, I highly recommend picking up a copy of their book! 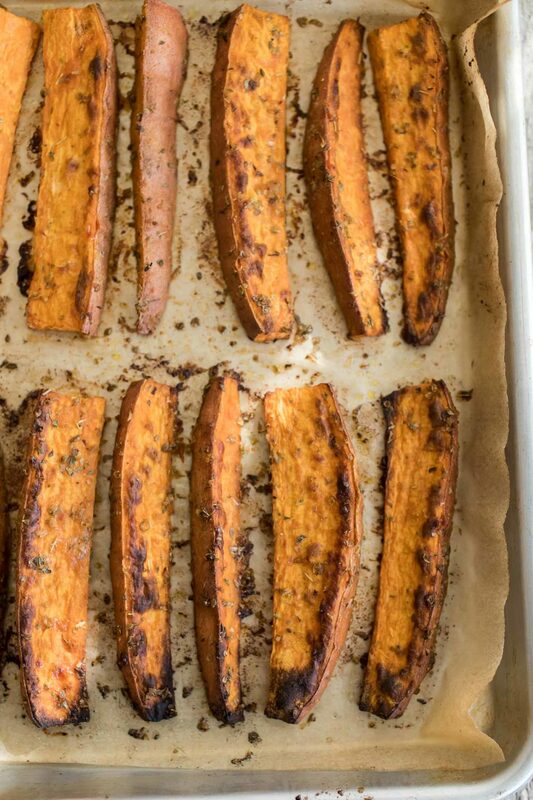 Sweet Potato Wedges from A Couple Cooks’ Pretty Simple Cooking. Roast the potatoes: in a small bowl, mix the garlic powder, oregano, allspice, and kosher salt. Wash the sweet potatoes, keeping the skins on. Slice each potato in half crosswise and then half again lengthwise. Place each piece cut-side down and slice it into 3 wedges, for a total of 12 wedges per potato. In a large bowl, mix the potatoes with the spice mix and olive oil. Line a baking sheet with parchment paper or a silicone mat, and spread the potatoes on the sheet in a single layer. Roast the potatoes for 30 to 35 minutes, until tender and starting to become crisp and browned (no need to stir). Make the chive cream: thinly slice the chives and mix them with the sour cream and kosher salt. Taste and add additional salt if desired. 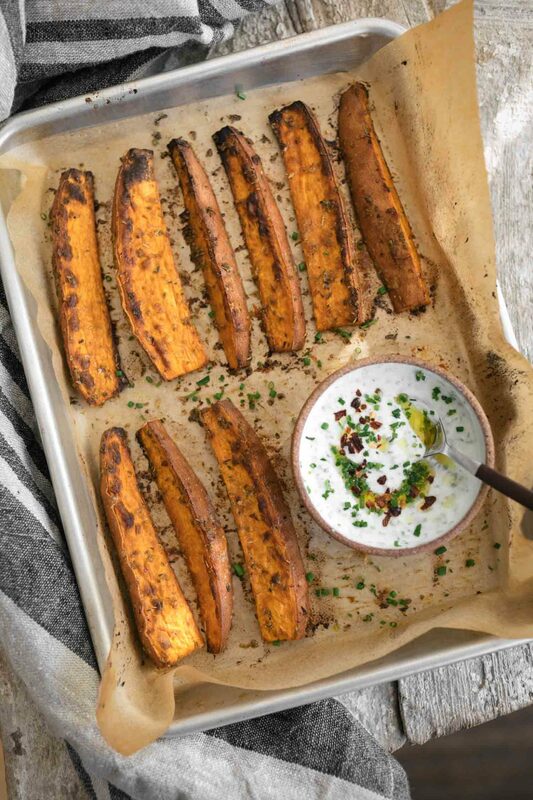 Serve the wedges warm from the oven, along with the chive cream. Tips + Tricks: They recommend using cashew cream for keeping this vegan (in place of the sour cream). I also only had yogurt on hand and used it strained in place of the sour cream. 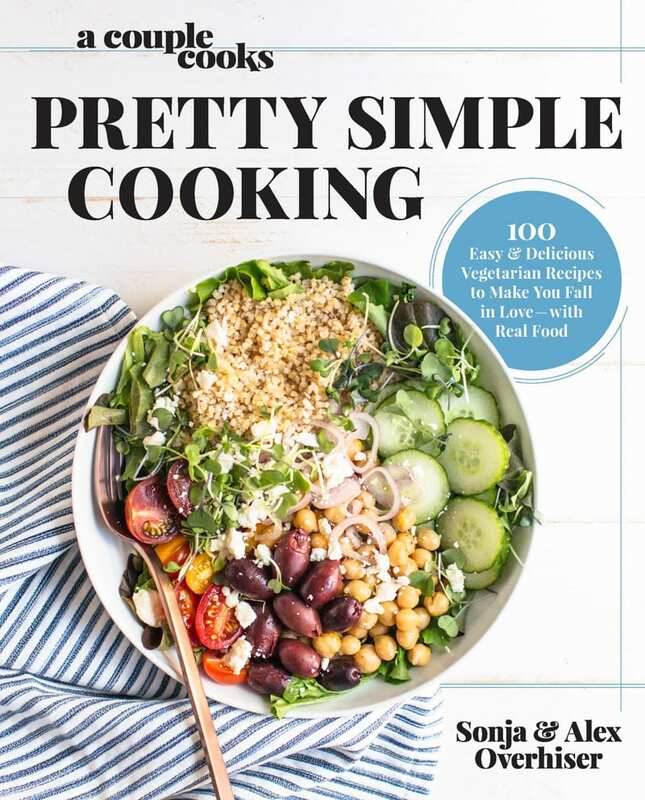 Link: Excerpted from A Couple Cooks | Pretty Simple Cooking: 100 Delicious Vegetarian Recipes to Make You Fall in Love with Real Food by Sonja Overhiser and Alex Overhiser. Copyright © 2018. Available from Da Capo Lifelong Books, an imprint of Perseus Books, LLC, a subsidiary of Hachette Book Group, Inc.